The convention-breaking jazz trio The Bad Plus makes its Lawrence University debut Friday, February 1 at 8 p.m. in the Lawrence Memorial Chapel as part of the college’s 2012-13 Jazz Series. The Bad Plus: Reid Anderson, bass; Ethan Iverson, piano; and David King, drums. Photo: Cameron Wittig. The trio —Wisconsin native t Ethan Iverson on piano and Minnesotans Reid Anderson on bass and David King on drums — first performed together as teenagers once in 1990. They spent the next decade out exploring their own individual musical languages before reconnecting in 2000. A year later, they released their debut, self-titled album to critical acclaim, earning “best-of” honors from the New York Times, Chicago Reader and others. 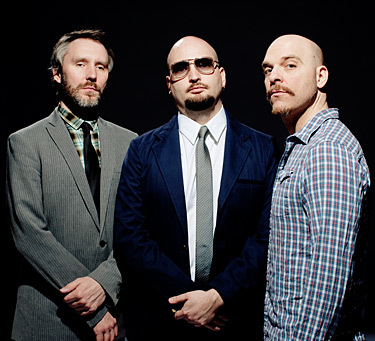 As a band, The Bad Plus has continually attracted diverse audiences, combining ground-breaking original work with creative, genre-hopping covers of artists as diverse as Nirvana, Blondie and Pink Floyd as well as Neil Young, David Bowie and Black Sabbath. The band’s discography of 10 albums includes 2010’s “Never Stop” and 2012’s “Made Possible,” both of which feature all original material. The trio, which has graced the covers of Downbeat and JazzTimes magazines, has toured steadily while collaborating with jazz legends Joshua Redman and Bill Frisell, among others.